I’ve been awake now for 21 hours, having just flown in from Edinburgh. So nice to be back, but I must admit I quite like to travel as well. This trip was such fun, and so creative. Good work with a lovely client, and a few days to go to great theater at the Fringe. Plays, music, comedy. I even snuck in a museum (or Gallery, as they are called in Scotland). And Edinburgh is truly one of the most beautiful cities in the world. I”ve been to 61 countries, and Edinburgh is in the top 5 cities in my estimation. My return flight was one of those effortless flights that make travel fun – even KLM was on its best behavior. Every flight was on time; there wasn’t a cloud to be seen anywhere, with great views of the glaciers in Iceland. Interesting seatmates: a woman who was returning from Germany after buying her 17 year old son a $70,000 Beemer (!?!) because he was a good kid and studied hard (Work after school to pay for his own gas?? Why? ); a Republican business man who loves the interesting Governor of Texas, Rick Perry (Sometimes my asperger’s coaching does me well – I was able to smile sweetly and change the subject instead of say what was sooo close to the tip of my tongue.). An American who worked on the rigs off shore. Nice folks all around being helpful and kind to each other. Darling babies running around airports. I even spent a very memorable evening (the parts that I remember) getting sloshed with my client who took me to The Scotch Malt Whiskey Society where I was given Innis and Gunn (a beer made from the whiskey cask… you’ll have to ask him to explain it) BEFORE drinking the single malt whiskeys, to prepare my palate for the different whiskeys I was given to try. Just don’t ask me how many because I have no idea…. What I do remember is that the whiskey they serve there is only made once, in one cask, and then never again. I’ve been so immersed in writing my new book without a day off since March, that I forgot what it was like to be a human. Although I did 6 hours of final page proofing on the flight across the pond (What are long flights for anyway? ), I did manage to have 4 days of plays and music in Scotland (and haggis for dinner every single night!!) which gave me the ability to see the world again through bright eyes. Work is necessary, of course. But I must remember to take regular time off to smell the flowers. Believe it or not, I am not a workaholic: this book project just took me over. But now I’m free. Back to dancing regularly, having weekends off to play with friends, and evenings off to do whatever I want. 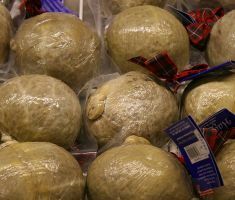 I guess it took this trip to make me appreciate what life is all about: good people, good theater, and an endless supply of haggis. Oh. And occassional malt whiskey. Contact Sharon Drew for team coaching. colleagues say – without bias or misinterpretation? Read Sharon Drew’s latest game-changing book: WHAT? Did You Really Say What I Think I Heard?